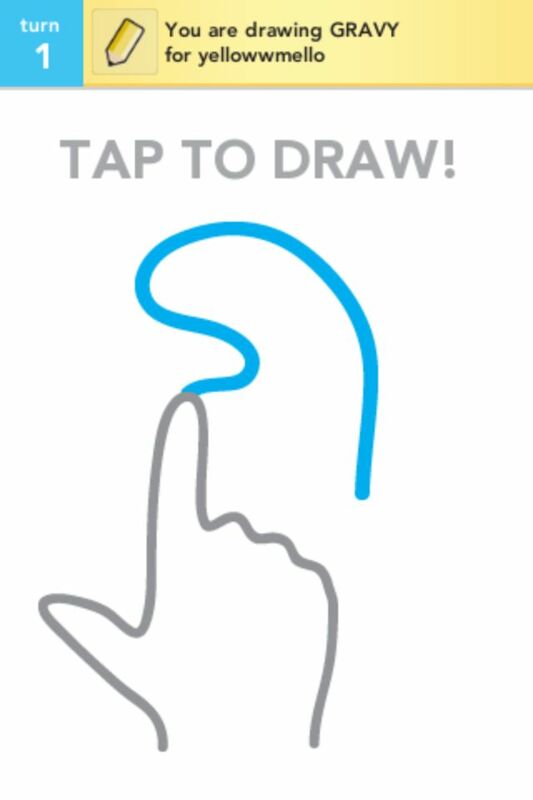 Since the iPhone launched, there have been countless drawing apps released in the App Store. 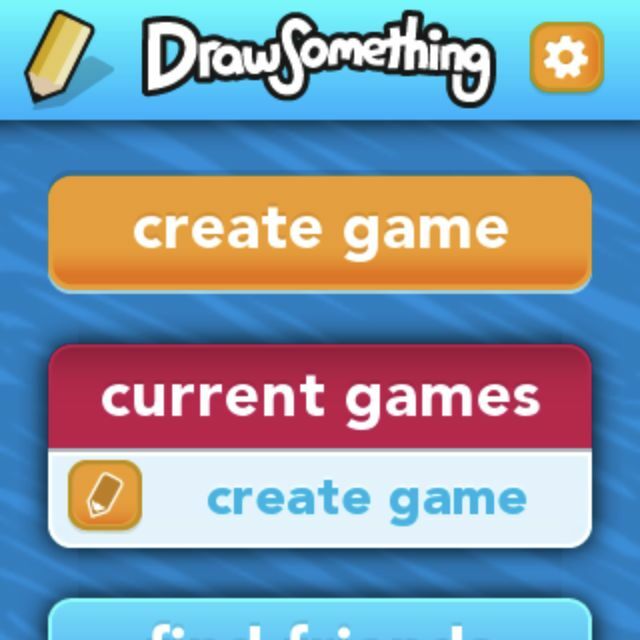 Draw Something by OMGPOP is a drawing app that offers something completely new. Ever played Pictionary? Well, this app allows you to do just that. The best part is that you don’t have to be in the same room as the person with whom you are playing. You don’t even have to play the game at the same time. Much like sending emails or text messages, you can send pictures back and forth to anyone who has the app. Play when you have time and then put it away for later. have to do it. 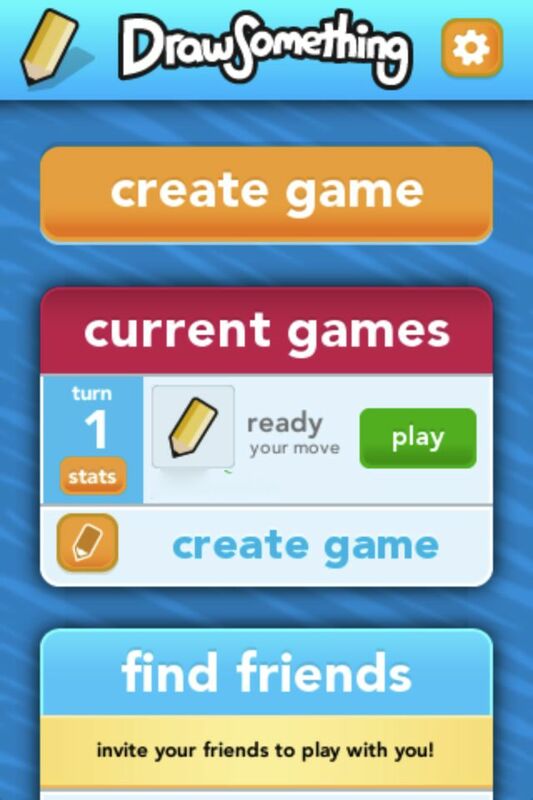 They can then create a game and look you up by email address or by the name that you choose for yourself. 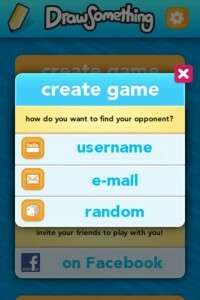 Another option is letting the app choose a random opponent. This option is great if you are bored and none of your friends are available, but it has its drawbacks. You don’t know who is on the other end. 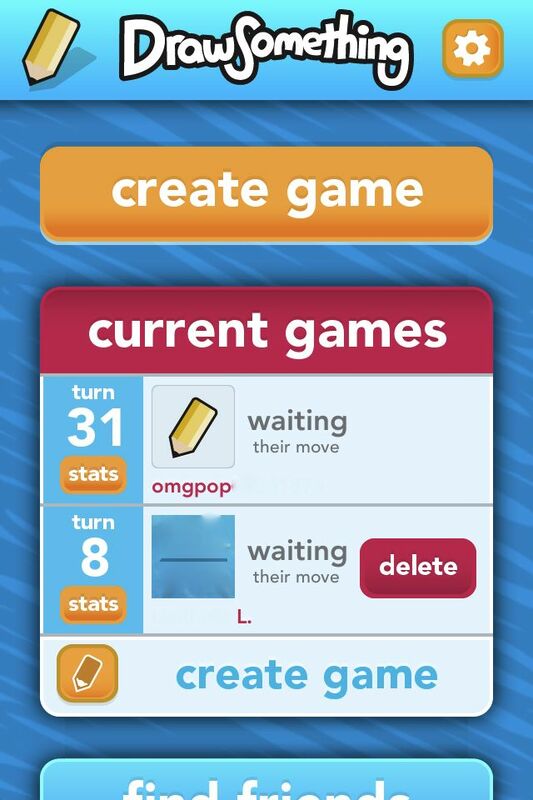 I have heard complaints of people drawing inappropriate pictures, which OMGPOP is trying to stop or limit. I have played a couple of games with random people. 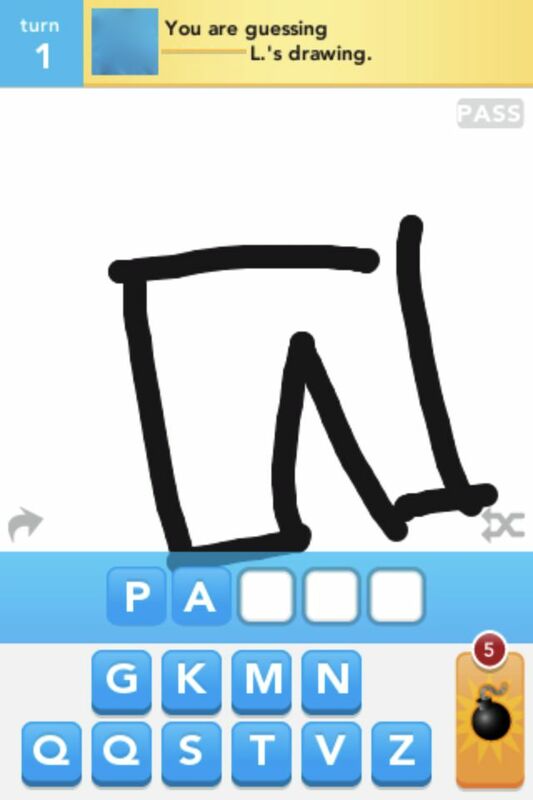 I did not run into distasteful pictures, but I did find that sometimes the person I was playing against would just write the word on the screen instead of drawing it. Kind of a cheap way to cheat. If they tell me the word, then I get it right and we both get coins. What is the point of collecting coins you might ask? Well, coins allow you to buy more colors. When you launch the game, your color pallet is very limited. For instance, I didn’t have green, which made for some funky looking trees in my pictures. You can also use the coins to buy bombs. These bombs, in my opinion are more useful than the colors. When it is your turn to draw a picture, you are given an easy, medium, and hard word. 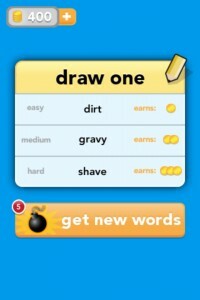 You can choose whichever word you would like to draw. If you don’t like any of them, you can use a bomb to blow them up and get a new set of choices. You can also use it when guessing the word another has drawn. 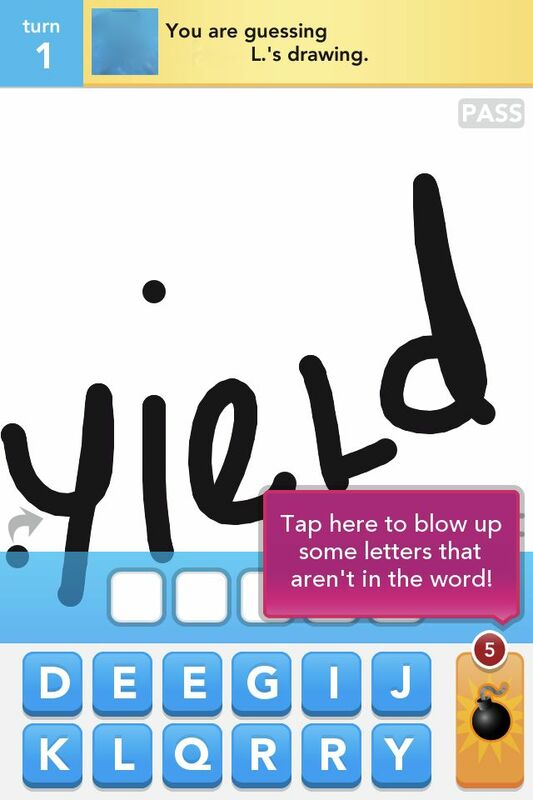 You can tap the bomb to blow up letters on the screen that are not used in the answer. Getting rid of these extra letters can be extremely helpful. 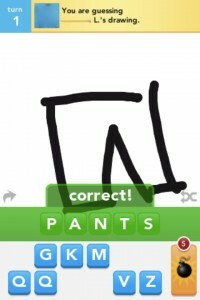 I have had a lot of fun playing Draw Something with people with whom I would ordinarily not be able to play creatively. Draw Something is well worth its cost in my mind. Tip : Once I was through playing a game with someone, i could not figure out how to delete the game from the list of ongoing games that I had. It had to go search the help section to find out what should have been obvious. Simply swipe your finger from left to right across the game you wish to delete to bring up the delete button and tap to delete just the way you would to delete an email or message. Yeah I love playing this game throughout the day, alaways a great way to kill some time. Sometimes I get paired up with people that want to cheat and spell out the words, but other than that It it’s a very fun game. I agree about the deleting of a game, they should have made it much more obvious. Anyways, this is a great free game and has an unlimited number of hours of play time. Great review Dorothy!